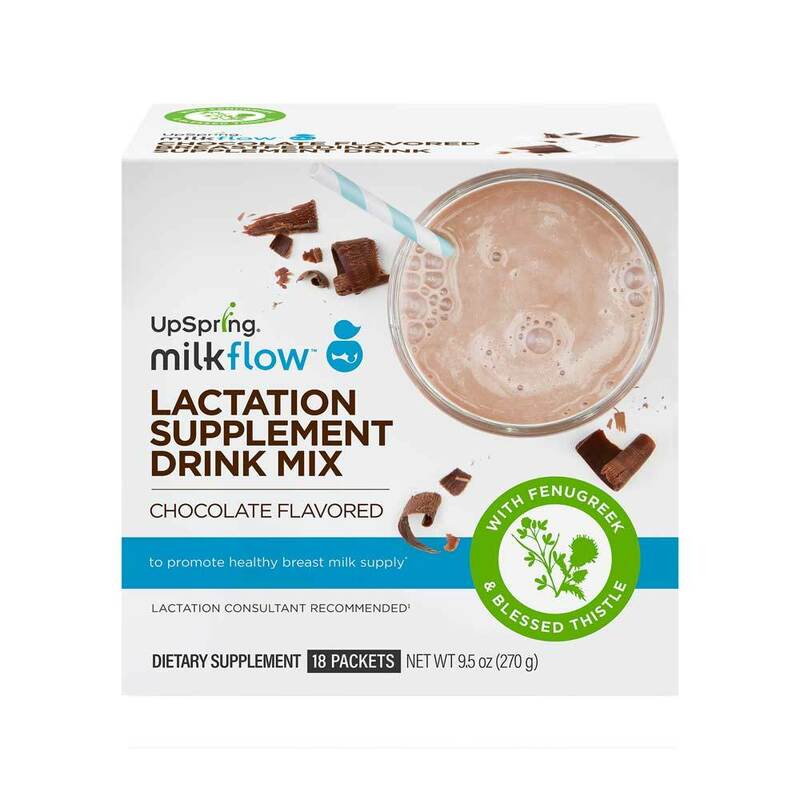 Three cheers for UpSpring Milkflow Chocolate Drink Mix … the tastiest way ever invented to get your fenugreek! It’s the first and only chocolate fenugreek beverage, formulated to boost your breast milk supply and taste great. * Mix with 6 to 8 oz of cold or hot milk, and enjoy. Why UpSpring Milkflow Fenugreek + Blessed Thistle Drink Mix? Milkflow is also available in Berry, Chai Latte and Capsules. See all Milkflow options here. Every ingredient on our label is all natural, so you can be confident that you and your baby are getting the best. Each packet contains a concentrated 10:1 fenugreek blend, giving you 1,800 mg in each serving. Add one packet of chocolate drink mix to 6 oz of cold or hot milk. Do not heat drink mix. Milkflow is also delicious added to a smoothie or stirred into yogurt. (You could even stir it into ice cream, but you didn’t hear that from us.) Milkflow contains dairy and soy but no gluten or GMO ingredients. Historically, fenugreek and other herbal remedies (such as blessed thistle and anise) have been used around the world by millions of women to improve breast milk production. * It is believed that fenugreek and blessed thistle work better when taken together. The ingredients in Milkflow drink mix grow in the ground; they aren’t created in a lab. Fenugreek, blessed thistle, and anise are herbs that have been used for centuries. We use only natural chocolate flavor and natural (not artificial) sweeteners. You won’t find any artificial ingredients in Milkflow Fenugreek + Blessed Thistle Drink Mix. You won’t find any GMOs, either (which kind of falls under the category of artificial, but we thought you’d want to know). No high fructose corn syrup … and no regular corn syrup, either. Plus, Milkflow contains no wheat, corn, eggs, or gluten. Milkflow DOES contain dairy and soy. Fenugreek, or trigonella foenum-graecum, is a plant from India and the Mediterranean. It has been used by generations of women to promote breast milk production. I’ve heard fenugreek gives off a maple syrup odor, is that true? The fenugreek herb has a natural maple scent. When taking a fenugreek supplement, a maple syrup odor may occur in perspiration or urine. But don’t worry – the scent does not need to be present for Milkflow to be working! Yes! While both plants are in the aster family, they are distinct from each other. Blessed thistle has yellow flowers surrounded by spiny leaves. It grows primarily in the Mediterranean region from Southern Europe to North Africa and in Western Asia. Flowers, leaves, stems and roots have been used in folk medicine, homeopathy, and, more recently, in pharmaceuticals. The blooms of the milk thistle plant are purple. While milk thistle originated in Europe, it is now found throughout North America. The leaves and stems contain milky white sap. The seeds contain active beneficial compounds and are used to create extracts and powders. Blessed Thistle is a known galactagogue, recognized for its ability to help increase breast milk production. Milk thistle is known for its liver-protective qualities and is used to treat liver and gallbladder problems. What is the difference between UpSpring Milkflow Fenugreek Blessed Thistle Drink Mix and UpSpring Milkflow Fenugreek Gummy? The drink mix, which comes in three flavors (Berry, Citrus, Chocolate), is a convenient way to get your fenugreek while staying hydrated. For days when you are on the go and don’t have access to a glass of water (or milk, for the chocolate flavor), or don’t have a minute to mix it, the gummy formula provides an easy way to get your fenugreek. How long does it take for Milkflow Fenugreek + Blessed Thistle Drink Mix to work? Can I mix Milkflow with liquids other than water? Sure! Milkflow Chocolate tastes great mixed with milk, almond milk or even coffee. You can mix our Berry and Citrus flavors with juice, sparkling water, or even soda water. Just add 6 to 10 ounces of your favorite beverage. We think it tastes great in smoothies, too. In fact, you can find a great recipe on our blog: https://www.upspringbaby.com/blog-milkflow-fenugreek-lactation-smoothie. Follow us on facebook.com/UpSpringBaby for more great ideas.